One can only envy to those, who takes great interest in shooting flowers. The objects for shooting are available n any time of the year: in the forest, in a botanical garden, on a flower-bed and in a flower-shop. Flowers are very decorative, and this means that the composition of your picture must be very simple. Otherwise the picture will turn out to be very fanciful, and the showy beauty of the flower, its amazing shape and rich color will be lost. Focus your attention on one plant and make a series of pictures. 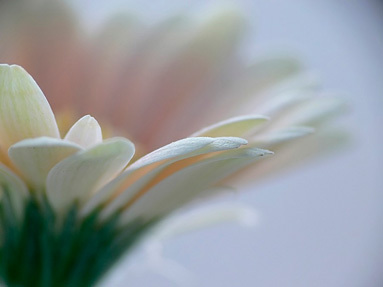 As a rule, flowers shall be photographed close-up, with small depth of definition in order to soften the background. The most important in taking pictures of flowers is to convey the details and do not distort the color. Consequently, the flowers shall be shot at scattered light. It is extremely important to direct the camera for hardness at small distance. If it rains, it doesn’t matter! It is even better to take pictures of flowers after sprinkling them with water a little. This will make them (and the image) fresher and the colors will become brighter. The wind won’t be a trouble either, we’ll have to make long exposure and will get a flower in motion, in flight. As flowers are rather small, one can use simple reflectors – sheets of white or colored paper, a transparent plastic umbrella, etc. Set the priority mode of the diaphragm, so that to obtain a sharp picture with maximum possible depth of definition or a blurred background (at completely opened diaphragm) depending on your idea. The mode of manual focusing at using macro-mode will give you the assurance in the fact that the camera has focused on the object of shooting, and not on the background You might face difficulties in reproducing color tints, especially the white color. The matter is that the matrix and a human eye perceive colors differently, and that is why white flowers turn out to be different, than we see them with the naked eye, they turn out to be colored. White flowers look very showy against the black background, whether it is a piece of black velvet or a sheet of matt paper. They are better to be shot without a flash, in bright scattered light. Direct sunbeams are not suitable for such shooting, it is better to choose an overcast day, or at least, a window-sill of a window, facing the north. One can use a sheet of white paper or white cloth as a reflector. In such a way you’ll be able to get undistorted tints of white color. Study the obtained picture and its bar chart. If necessary, change the parameters of shooting and repeat the picture. Plots with flowers and plants are really unlimited. It is rather interesting to tale pictures of stems, leaves, and leaflets in macro-mode: such pictures are very showy, and it is comparatively easy to make them, and the object is not in a hurry – and this is real luxury for a photographer.